Rushmore Chewings Fescue is the ideal choice for those low maintenance situations where a hardy turf is desired. With its excellent resistance to Red Thread and Summer Patch, drought tolerance and recovery, Rushmore persists in the toughest turf challenges. 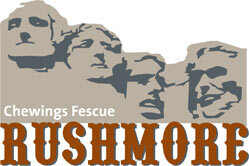 Rushmore is cold tolerant and is perfect for shaded areas. Rushmore Chewings Fescue can be used in blends with other fine fescues for a low maintenance turf or mixed with Kentucky bluegrass and perennial ryegrass for lawns, golf courses and parks.